MLM iPhone App With More Network Marketing Companies And Enhanced Features To Easily Determine The Best MLM For You. Kadence Creations, LLC released version 1.1 of their iPhone app, MLMipedia Pro. This update adds more network marketing companies for users to choose from and enhances existing features for a more user-friendly platform. MLMipedia Pro provides consumers and unbiased tool to help evaluate and compare the top companies in the network marketing industry. MLMipedia Pro, version 1.1, allows people to compare more network marketing companies, to determine which one is a good business match for them. 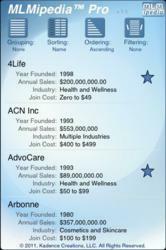 The MLM industry consists of hundreds of direct sales companies, each with unique products, varying comp plans, and different entry level costs. MLMipedia helps users compare and contrast these companies to determine which MLM is best for their needs. Typically people are informed about network marketing companies through friends and family. They are encouraged to attend meetings, watch videos, and view marketing materials to see if the particular company is a good fit for them. Most of the presentations are made in a pressured environment in which the person is compelled to make a decision on the spot. MLMipedia Pro takes the pressure way from those interested in joining, or even researching, network marketing companies. Users are able to view top MLM companies, the specifics of each one, important web links for comp plans and bios, and then compare/contrast them to find a good match. This latest version adds more companies and creates an easier interface to sort, group, order and filter them to the user's liking.